Hooray! Tax season is over. I will now attempt to be more of a player here. 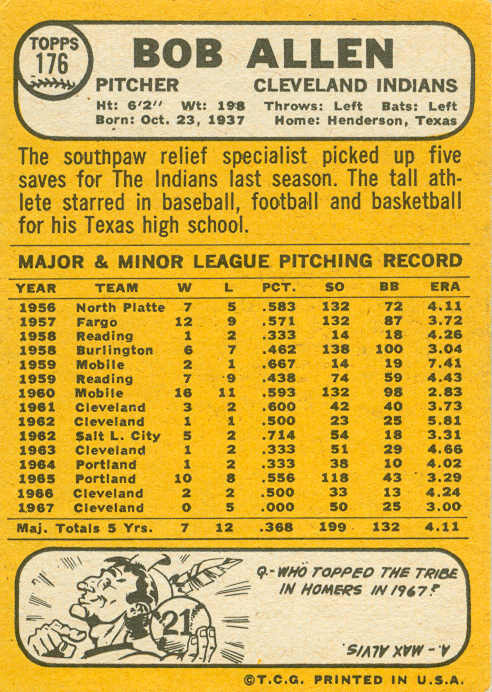 Here is the final card for Indians' pitcher Bob Allen (#176), who had a 5-year major-league career, all with the Indians. Allen was signed by Cleveland in 1956, and spent 5 years working his way up the minor-league ladder, beginning in Class D in 1956. For his first 3 seasons, one of his teammates was future big-league pitcher Jim Perry. 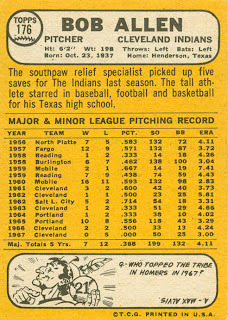 Bob made his major-league debut in 1961, as a member of the Tribe's bullpen. He appeared in 48 games as a rookie. He regressed in 1962, pitching only 30 innings in 30 games, while spending part of the season with triple-A Salt Lake City. In 1963, Bob returned to the Indians for a full season, logging similar playing time as he did in 1961. Allen was the only lefty in the bullpen, which this year included ace Ted Abernathy and 43-year-old veteran Early Wynn. Allen and Abernathy were the only pitchers on the team not to make any starts. After the 1963 season, Allen was traded to the Pirates, who returned him to Cleveland before the 1964 season. 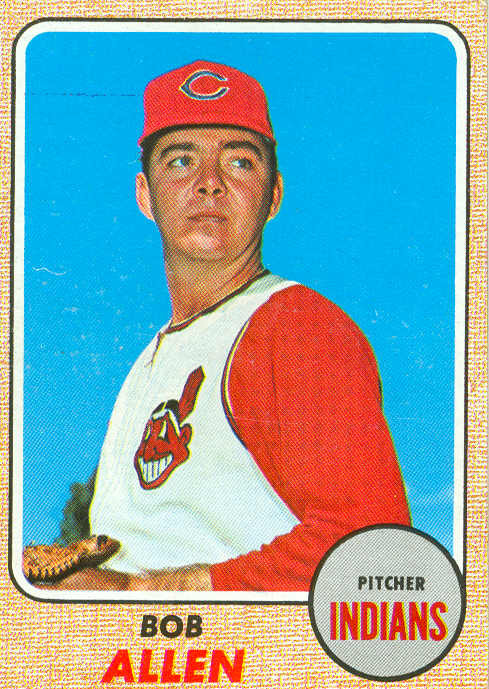 Bob spent the next 2 seasons with the Indians' triple-A team in Portland, Oregon before finally returning to Cleveland for the entire 1966 and 1967 seasons. An 0-5 record in 1967 spelled the end of Allen's major-league career. Over 5 seasons, he pitched in 84 games, all in relief. 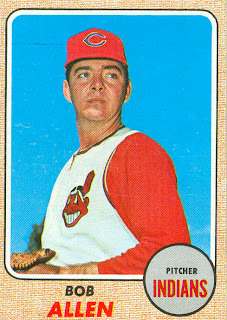 Bob continued to pitch in the minors for the Indians (1968-70), Angels (1970), and the Padres (1971-72) before retiring.